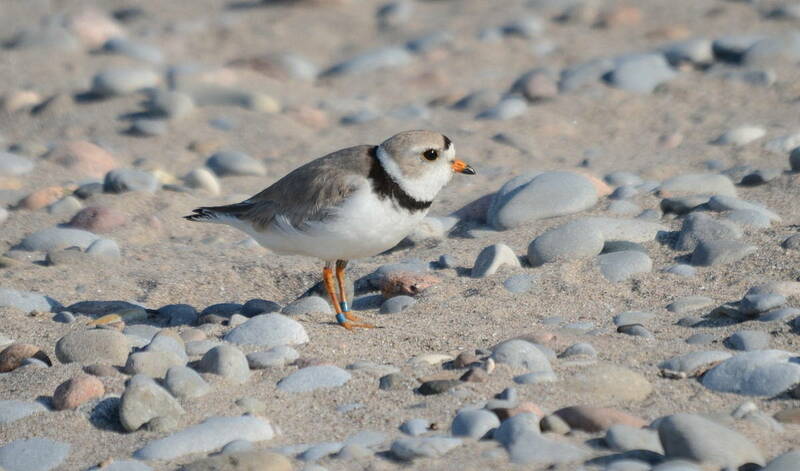 What a thrill to learn that, this year, not one but two pairs of Piping Plovers have nested on the beach at Darlington Provincial Park here in Ontario. This is really noteworthy for three reasons. One, this species has never nested in Darlington Provincial Park before so is a new breeding species for Durham Region. 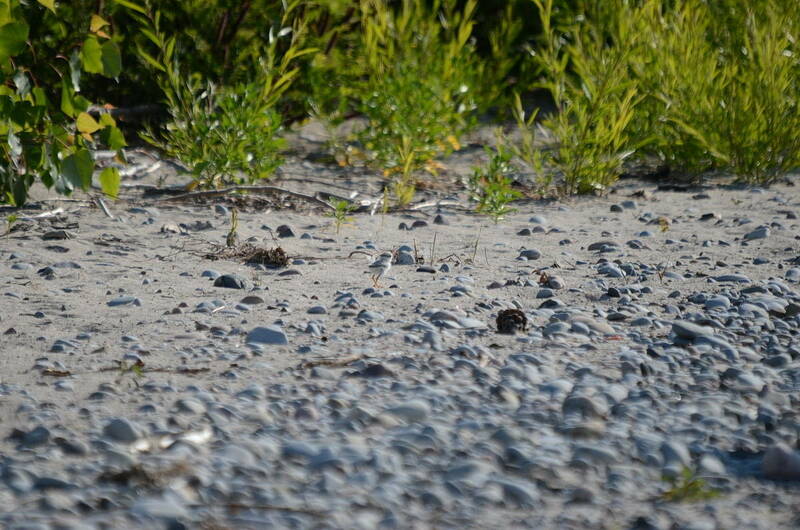 Two, these Piping Plovers represent the first successful breeding pairs on the Canadian shores of Lake Ontario since 1934. 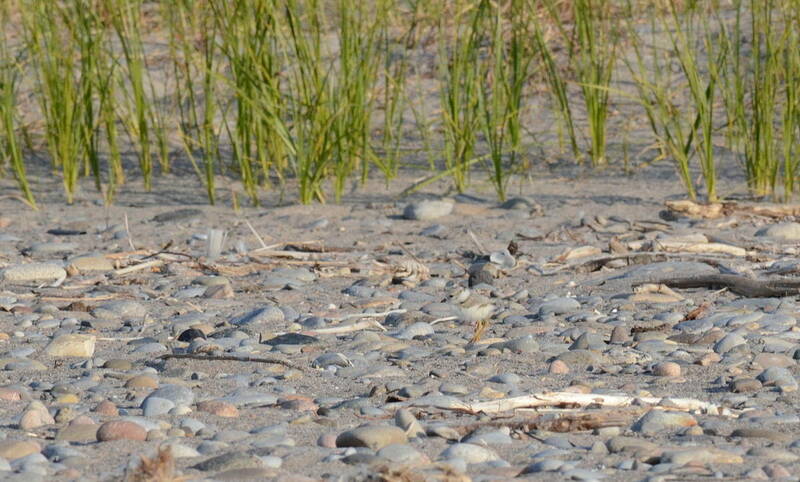 And three, these are the first confirmed nesting pairs within the Greater Toronto Area in 81 years. A success story whichever way you look at it. 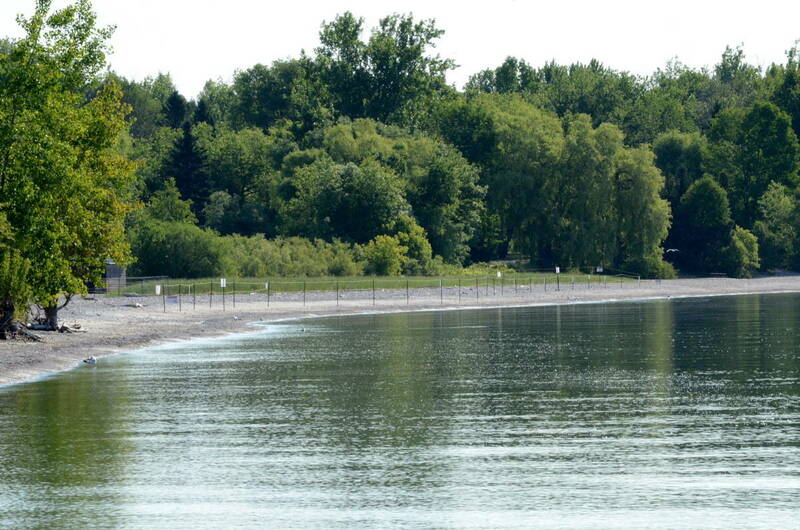 What greeted us when we walked one section of the beach at Darlington Provincial Park was a large fenced area suitable for keeping the Piping Plovers and their nest of eggs safe from predators and careless humans. We had been told what to expect, and with the numbers of Gulls frequenting the edge of the water and fishing just offshore, we were grateful that such precautionary measures had been taken. As Bob and I approached the enclosure and commenced scanning the rock-strewn sand for the week-old chicks, which originally numbered four but were already down to three, no sign of the young birds or the adults could be seen. We breathed a huge sigh of relief when Bob caught a hint of movement in amongst the smooth grey stones that littered the beach. 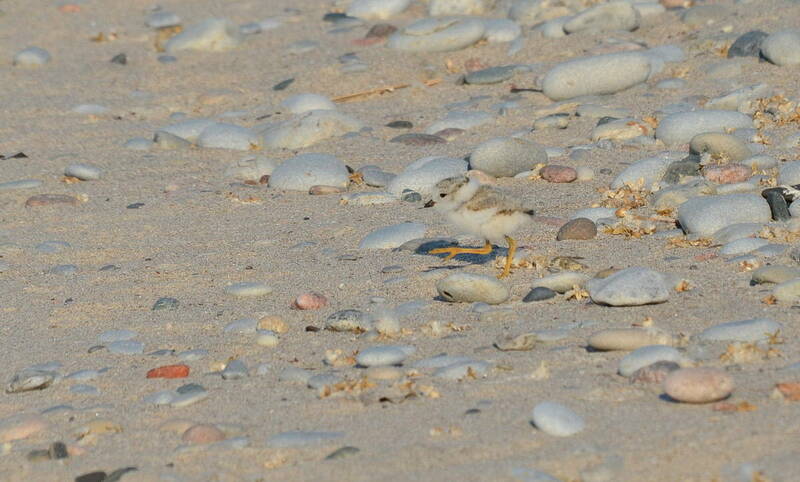 Once we determined it to be one of the recently-hatched Piping Plovers, we could see why it was so critical to watch where we stepped. The camouflage provided by the baby’s plumage so precisely blended with the dry, tan-coloured sand that it was almost invisible. 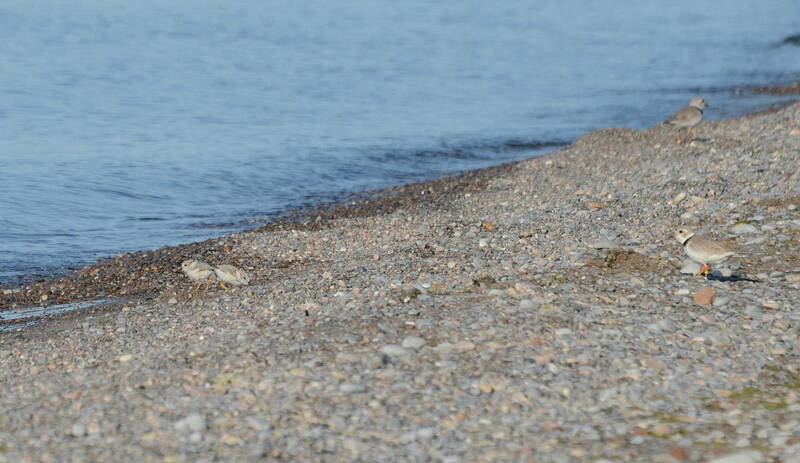 Further inspection of the beach revealed the two adults and all three babies. Even though the adult birds are larger, it was no easier keeping track of them as they scurried about the shoreline to keep their offspring in check. The back of an adult Piping Plover is the colour of dried sand so their presence on a beach is difficult to detect at the best of times, a huge advantage when trying to avoid predators. 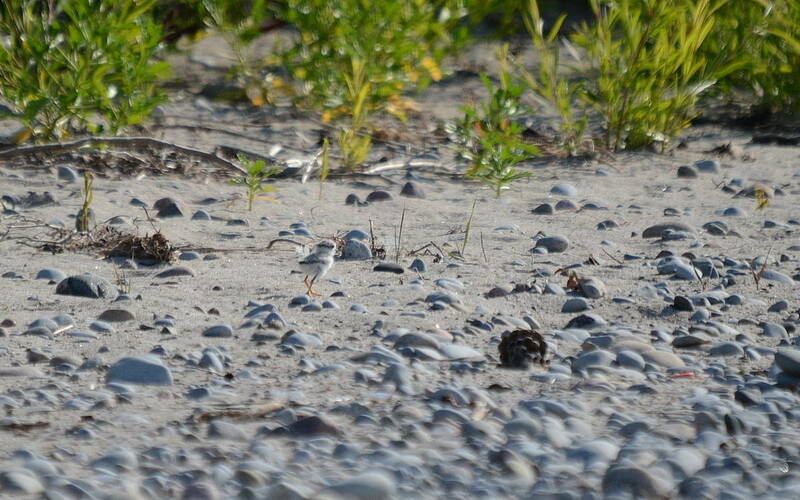 For a few years now, Bob and I had heard about the return of endangered Piping Plovers to Wasaga and Sauble Beaches, also in Ontario, and in 2015, a pair attempted to raise a brood near Hanlan’s Point on the Toronto Islands, but that attempt failed when a storm washed the nest and eggs away. That is why we are so excited about the success of these pairs. Can you find the baby in the photo above? Seen here are the two adults, side by side. During breeding season, both the male and female show a single black collar that provides a reliable way of identifying the male from the female. His is wider. When not breeding, the black chest bands become less pronounced. 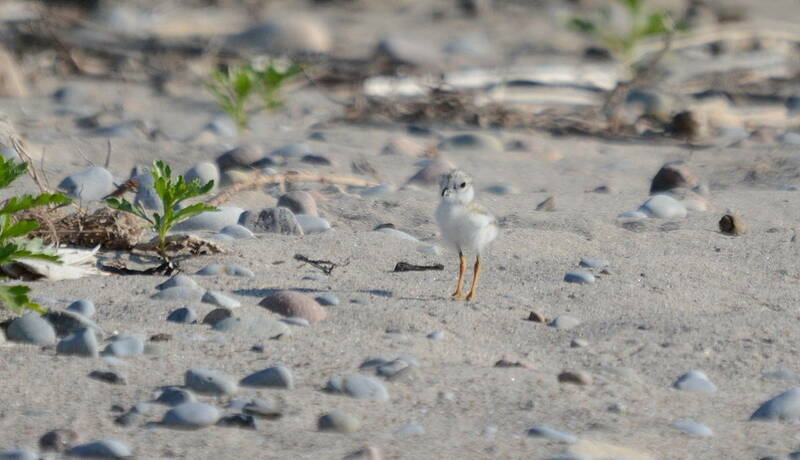 Baby Piping Plovers are not considered fledglings until they can fly at least a distance of 50 yards (46 m), and they do not acquire this skill until they are about a month old. 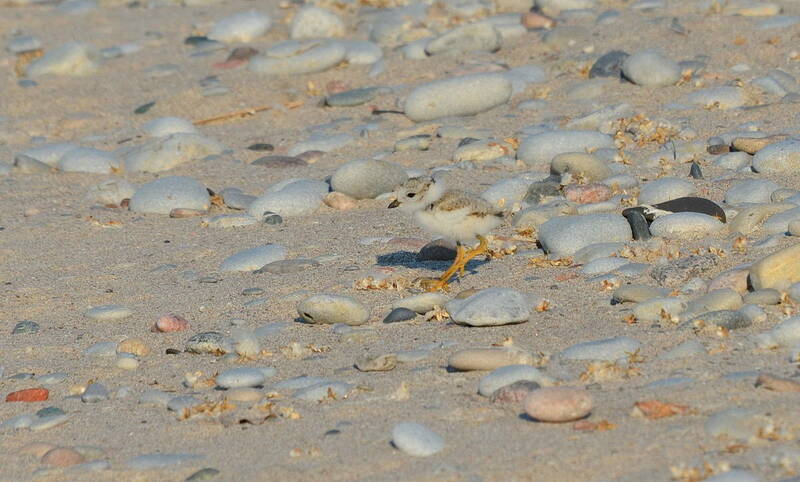 When we visited the beach, the young birds were just eight days old. 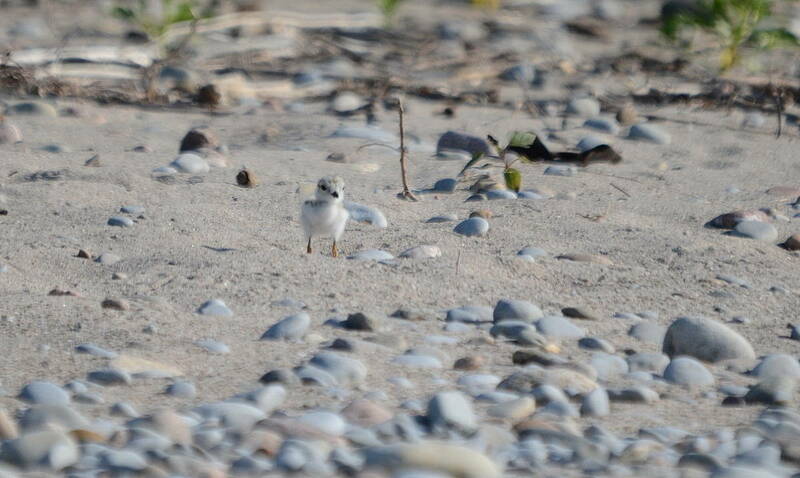 Within hours of hatching from the eggs, Piping Plovers are able to forage for food, and as Bob and I looked on, the small puffballs edged closer to the water in search of small invertebrates, insects, worms or crustaceans. 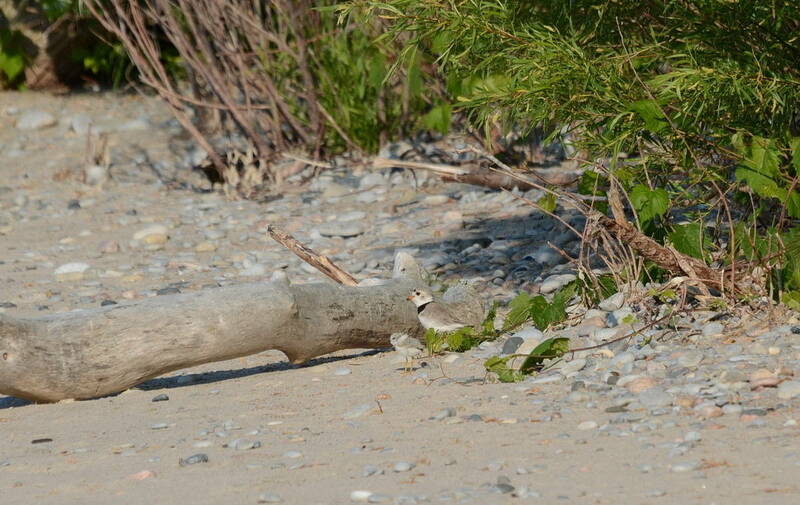 In typical Plover style, the chicks run in short spurts then stop and scan for something to eat so keeping our eye and subsequently our camera trained on their location was quite the feat. 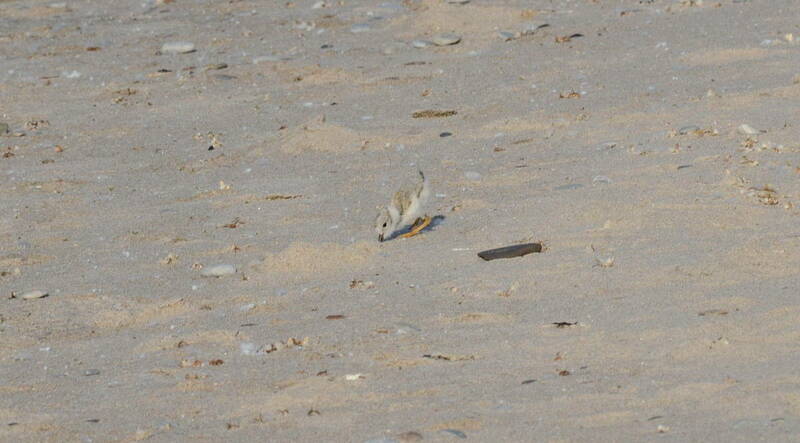 Speaking of feet, the yellow-orange colour of a Piping Plover’s feet and legs is also diagnostic to the species. Once some tidbit is located, a Piping Plover will lean forward and peck at the sand or perhaps catch some tiny prey in a small pool of water. 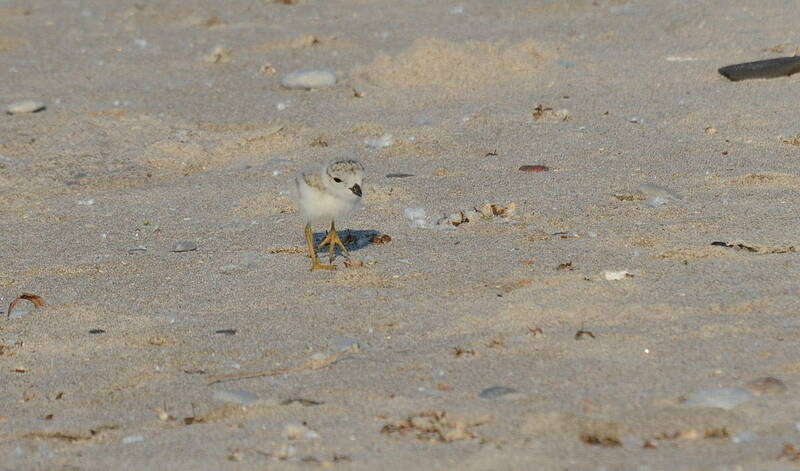 Fondly compared to fluffballs on matchsticks, a baby Piping Plover could fit between two cupped hands, and because they cannot fly for the first month of their existence, one of the biggest threats to their survival are humans who accidentally step on them. Of course, foxes, crows, and cats, not to mention dogs, all pose a threat to these delicate little birds that inhabit the wide open beach between the water’s edge and the back line of vegetation. 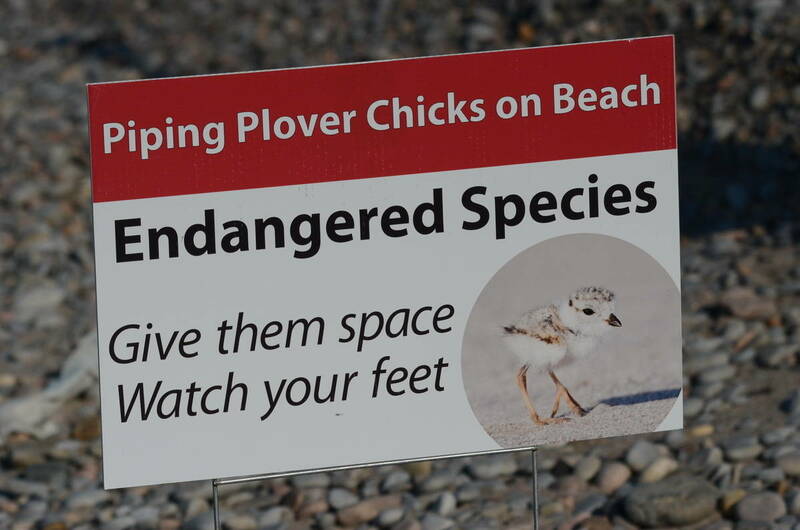 This goes for the adult Piping Plovers as well but at least they can take flight. Having learned of a second enclosure for the other pair of Piping Plovers that were currently sitting on eggs, Bob and I made our way further west along the beach. We moved slowly and carefully so as to give this first family time to move away from us, but instead, the adults led their 3 offspring in the same direction. 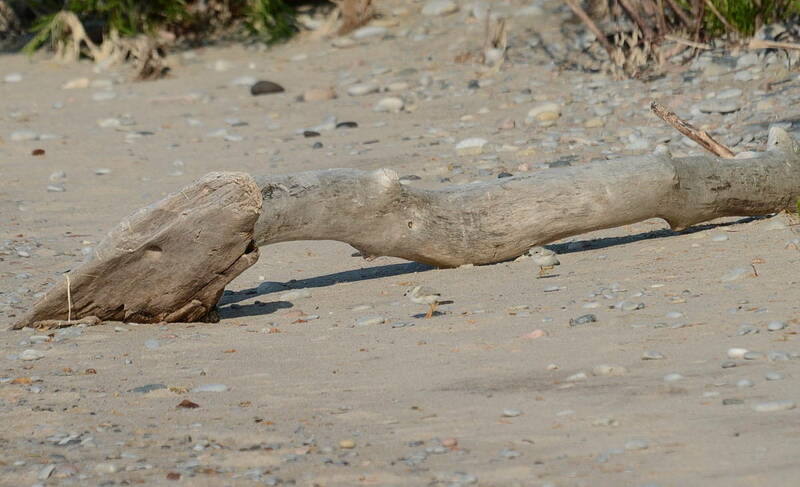 It was helpful when, on occasion, the Plovers would come up against an object such as this driftwood that contrasted their plumage sufficiently to make them more noticeable. 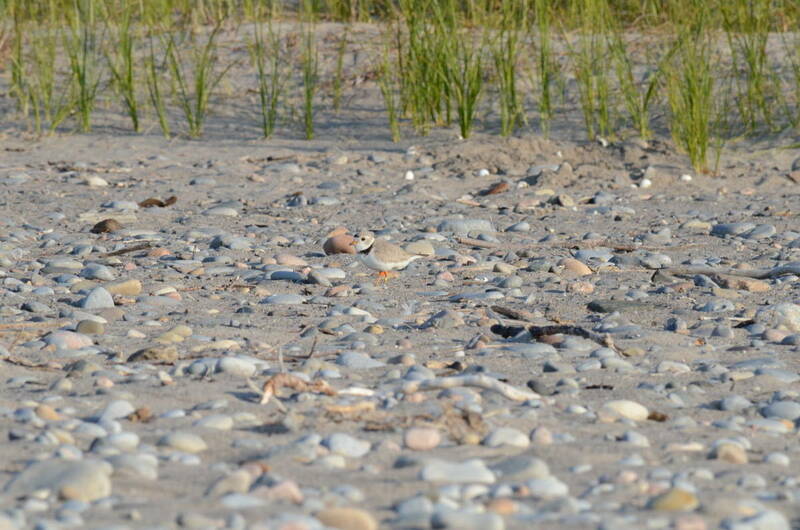 The feeble, plaintive call of a Piping Plover serves to remind us of the fragile beauty of the beach habitat that they call home, where it is often severe storms that will claim the eggs or injure the chicks. Groomed beaches lack the necessary hiding places afforded by such things as this old tree trunk and the coastal vegetation beneath which the chicks can seek cover. Eventually, Bob and I headed inland through tangled brush to avoid “chasing” the Piping Plover family further away from their nesting ground. 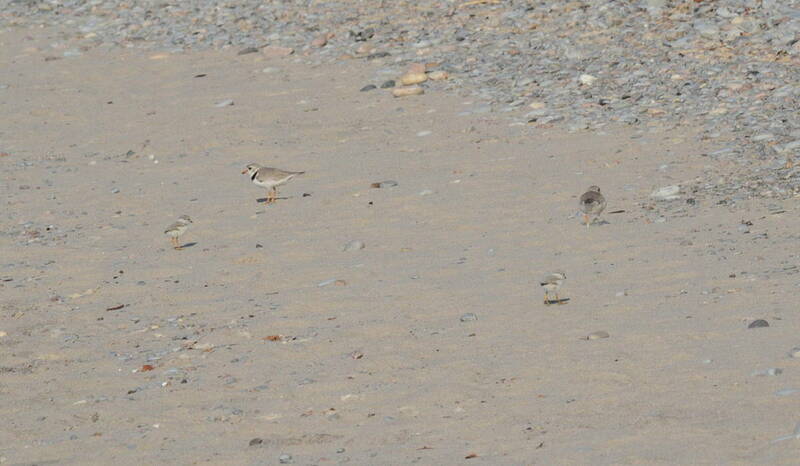 Soon, we were met with the back side of the next enclosure that housed the nest of the second pair of Plovers. That pair, I will talk about in a separate post. 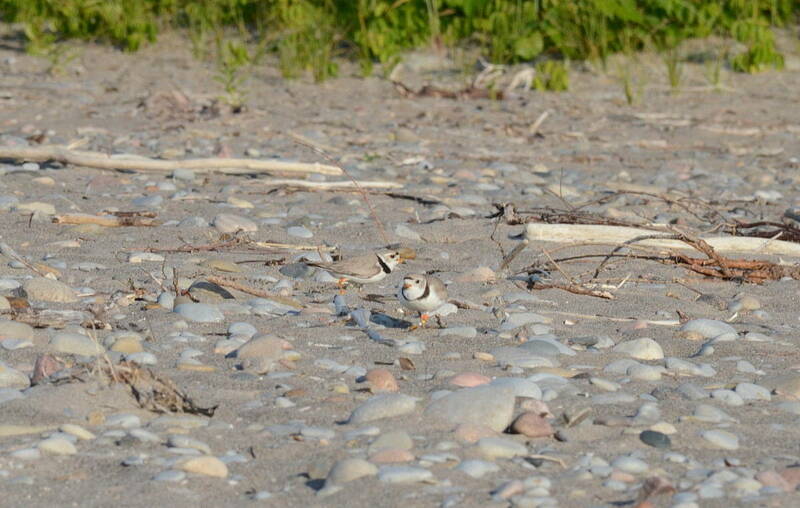 What a delight to have the opportunity to observe these tiny treasures born to a male Piping Plover from Wasaga Beach that itself had hatched in 2015, and a female that hatched in Michigan in 2012. With any luck, perhaps, over time, these white and grey shorebirds will grow to sufficient numbers to be removed from the endangered species list. For the time being, many people are working to ensure the safety of these nesting birds at places like Darlington Provincial Park.